Quincy Jones, or the man they simply call “Q” has finally been recognised in his lifetime with a documentary entitled “Quincy”. The film comes was premiered at the Toronto International Film Festival on September 9 2018 and garnered its fair share of stardust along with other American and other productions from all over the world. The film takes a close look at the extraordinary life of Mr Jones, a seminal figure who spent some of his earliest, formative years in Jazz with Lionel Hampton and later with the CBS Stage Show, and in a studio band where he played 2nd trumpet and backed Elvis Presley before taking his trumpet and later becoming the music director of DIzzy Gillespie’s Big Band. Perhaps his greatest contributions to Jazz came when he became arranger and music director for the Count Basie Band. As a producer Mr Jones’ big breakthrough came in 1961, when, he rose from the production ranks to become the first Black man to hold the position of vice-president of Mercury Records. It was then that he also turned his attention to film scores and wrote one of the best-loved themes for In The Heat of the Night which starred Sidney Poitier. As a producer Mr Jones credits included music for The Fresh Prince of Bel-Air, which virtually launched the career of Will Smith. But perhaps his finest achievement in film was collaborating with Oprah Winfrey to take Alice Walker’s award-winning novel The Color Purple to the screen. In the late 1950’s Mr Jones met Frank Sinatra and Princess Grace of Monaco, and was invited to curate a benefit concert for the Monaco Sporting Club. He also arranges and conducted Frank Sinatra’s second album with Count Basie, It Might As Well Be Swing. Among his many celebrated stage appearances include epic productions when he was invited by Claude Nobs, founder of the Monteux Jazz Festival in Switzerland, to be Music Director of the Festival. Here he produced such memorable events of From Bebop to Hip-hop and one of the last great concerts featuring Miles Davis whom he persuaded to return to the great repertoire that he (Davis) had created with Gil Evans. Also, while working with Michael Jackson – whom he also produced and virtually launched on a stratospheric path – on the film The Wiz Mr Jones became involved in Mr Jackson’s most successful albums, Off The Wall and Thriller, a production relationship that crested with the USA for Africa whose clarion call was “We Are the World”. Mr Jones’ social activism began in the 1960’s with his support for Martin Luther King and he became one of the founders of the Institute for Black American Music (IBAM) in an attempt to raise funds to create – among other things – a national library of African-American art and music. He is also founder of Quincy Jones’ Listen Up Foundation which built over 100 homes in South Africa and worked to help educate youth in that country. Commercially, Mr Jones is one of the most successful producers in music and his ventures include Qwest Productions, Qwest Records and Qwest TV, which – together with Reza Ackbaraly has launched the first subscription video-on-demand service for Jazz and other music from around the world. Naturally this impressive history was hard to capture on film, but having his daughter Rashida Jones team up with Alan Hicks to direct the biopic, and with the vast archives available for and woven into the production this production, the result is the fascinating story of a man the world knows simply as “Q”. Although one cannot draw comparisons with recent attempts at biopics including ones about Chet Baker and Miles Davis, Quincy certainly is a far superior production because it relies on Mr. Jones to “play” himself. Mr Hicks, who is well known for his fascinating documentary on Clark Terry and his mentoring relationship with the prodigious blind pianist Justin Kauflin, entitled Keep on Keepin’ On brings his forthright documentary directorial style to this epic production. And the two-hour long documentary provides a wonderful and honest picture of one of the most iconic figures in music, a real-live character who counts men like Lionel Hampton, Count Basie, Dizzy Gillespie and Marvin Gaye, Michael Jackson, Lionel Ritchie and Bono as friends just as he does Oprah Winfrey and President Barak Obama as friends too. 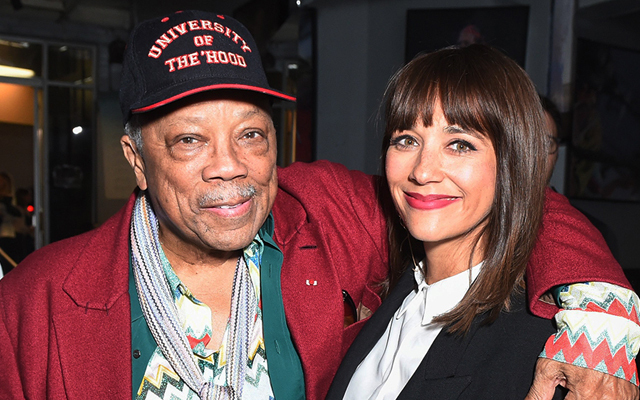 Rashida Jones, Quincy Jones’ daughter, was born in Los Angeles. She studied religion and philosophy at Harvard. She is an actor, writer, producer, and director for film and television. Quincy (18) is her latest film. Alan Hicks was born in Wollongong, Australia. He studied jazz at William Paterson University in New Jersey. He directed the documentary feature Keep on Keepin’ On (14) about the extraordinary relationship that developed between Clark Terry and the blind pianist Justin Kauflin. Quincy (18) is his latest film.